Download and play 4K 8K videos for giggles and shits? That's not what you want! Trying to figure out what's the ideal spec of your computer to play 4K/8K videos without any issue? It is inevitable that you encounter high res (4K 8K) video playback problem every now and then. 5KPlayer will help you out! In order to play 4K and 8K video without issues, among other basic requirements, you'll need a professional 4K/8K video player -5KPlayer as well to minimize and eliminate the possible influences that may lead to playback failures based on its harware decoding feature. Common problems with playing 4K/8K videos: While watching 4K/8K videos on YouTube, always get stuttering, choppy, unwatchable playbacks? Confronted with videos skipping second after second? Finding that the frame rate drops to 16 fps? Falling into an abyss of unknown 4K/8K play errors with blank screens? Instead of tackling those 4K/8K video play problems one by one, which seem to be complicated and thorny, let's just face the truth –have you got the all the prerequisites to play 4K/8K videos without hassle in the first place? If not, refer to the following requirements to avoid any problems during 4K/8K video playing. *Display: 27-inch (diagonal) Retina display with IPS technology; 5120-by-2880 resolution. *CPU: 3.3GHz quad-core Intel Core i5 processor or 3.5GHz quad-core Intel Core i5 processor or even better -Configurable to 4.0GHz quad-core Intel Core i7. *GPU: AMD Radeon R9 M290 graphics processor with 2GB of GDDR5 memory or AMD Radeon R9 M290X graphics processor with 2GB of GDDR5 memory or even better -Configurable to AMD Radeon R9 M295X with 4GB of GDDR5 memory. It is often the case that you cannot play 4K/8K correctly due to the lack of optimization of the player. Therefore, you should get a professional media player to optimize the playback quality and rendering the effect to avoid any problems during 4K/8K video playing. 5KPlayer, so to speak, is your second to none choice! 5KPlayer, as its name implies, is specifically designed for high definition video playback and is very capable in dealing with them. Working with those ridiculously high end monitors, 5KPlayer is capable of rendering the full brink of every pixel sent to it. It plays 4K videos, and allows you to watch 8K movies as well as 3D films at home on both Windows (10) and Mac (IE Captain) OS, an adaptable media player fitting perfectly for iMac 5K. Besides, since limited internet bandwidth may vex you and blemish the smoothness of 4K/8K videos online streaming, 5KPlayer makes your 4K/8K downloading wishes come true within a few clicks. An even bandwidth can be a bottleneck to 8K online streaming, so you'd better guarantee that at least a 100M bandwidth is provided. For 4K video playing online without stuttering, a bandwidth of around 20-40M is a must. HTML5/Chrome can handle 4K/8K video play problems in general, but more often than not, they all do crash. In this scenario, we suggest you to download the whole 4K/8K video to avoid troubles with playback online. 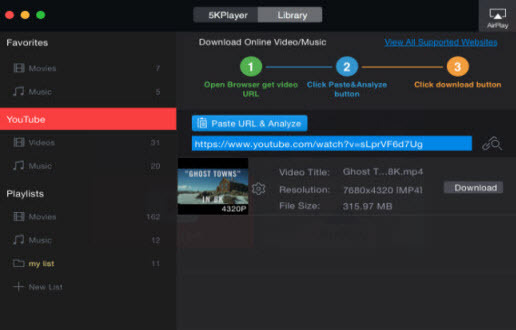 You'll see a brief guide on video downloading with an analysis box provided below. Step 4: Copy and paste the link of a 4K/8K video into the analysis box and click for analyzing. Within a few seconds, a videostrip will show up with a thumbnail, video info and a download button. You'll be noticed when the video is successfully downloaded. Step 6: Click the video list to find the 4K/8K videos and double click the thumbnail for trouble-free 4K/8K playback. Note: Computers with 8K display are hard to find these days, however, HDTVs with 8K display are already on the market for your picky visual demand. 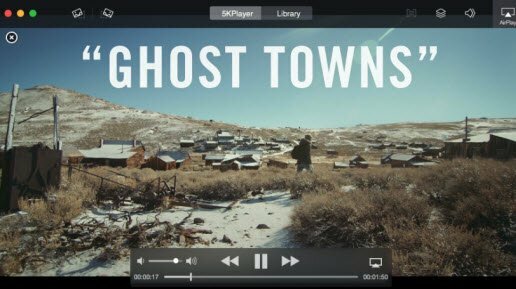 In case that you've got a TV with 8K display and a decent computer that can handle 4K/8K videos, this 4K/8K video player –5KPlayer, will allow you to stream 4K videos and AirPlay 8K videos to your big 8K TV flawlessly. 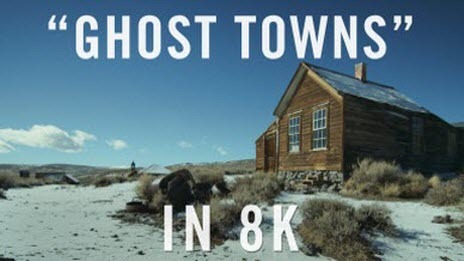 Here you can free download 8K video player for Win 10 that renders perfect 8K video playback.